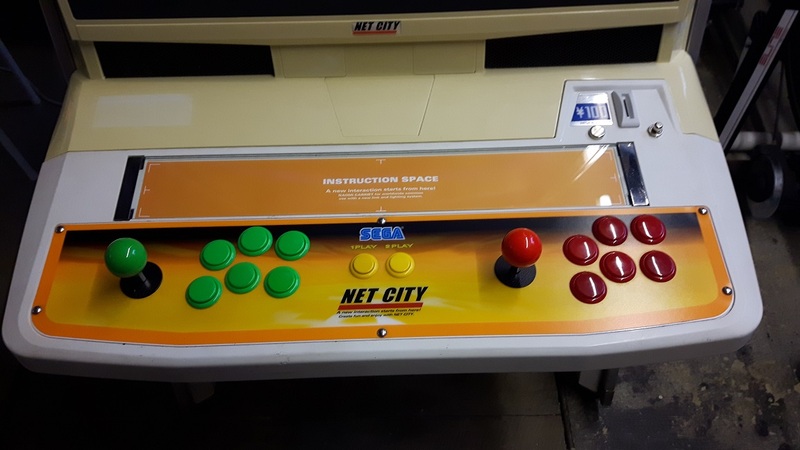 Want to buy a WTB Sega Net City control panel as well as the instruction space above it if possible. Preferably with the orange type of overlay. Did you buy the control panel and/or overlay somewhere or did it come with the machine? I have them available in my store. Using these overlays I assume I can use any control panel from e.g. Sega Blast City, New Net City and moee right? Mine are cut to HOT-2005 shape. I do the outer shape and coach bolt holes but not the button holes as there are so many different configurations. Was there any original/typical color/colors used for joystick and buttons or? Sega have been using Green for player 1 and Pink for player 2 for many years. Before this, they used Red for player 1 and Blue / Cyan for player 2, on cabs like the Aero City. By the days of the New Net City, despite everything going mono / silver / grey / black, it seems red and blue were 'official' again! I'd just do whatever you think fits nicely with the control panel overlay. I have a complete Naomi Net City set... Marquee holder with marquee instructions card and 2l12b Control panel... also think I have a coin chute cover and 100yen sticker somewhere too. Can you please send me some pic?